It is our hope this finds you all well. As you know Tolkien Reading Day is celebrated worldwide on March 25th. The New York Tolkien Conference is celebrating this event two days earlier this year on Friday March 23rd, which is due to scheduling arrangements and organizing of this event. We took a hiatus in 2017 due to unfortunate circumstances but the Conference returns this year with a very special program. The One Ring was made by and meant for Sauron, the malevolent Maia gone rogue. But Sauron’s great defeat at the end of the Second Age, and the ‘accidents’ of history, cause it to be borne by six very different individuals, of very diverse origins, social status, and moral character: the Númenórean king Isildur, the river-halflings Déagol and Sméagol/Gollum, and the Hobbits Bilbo Baggins, Frodo Baggins, and Sam Gamgee. On March 25, the ‘anniversary’ of the final relinquishing of the Ring’s great burden, we will compare and discuss the lives and personalities of these six ringbearers as a way to come to grips with Tolkien’s fascination with special items or tokens (Palantiri and Silmarilli as well as the Rings of Power) and how they illuminate his understanding of creativity and possessiveness. Nicholas Birns first read The Lord of the Rings in the early months of 1975, finishing very near to the memorable day of March 25. He has published on Tolkien in Tolkien Studies,Mythlore, and The Journal of the Fantastic in the Arts. He is also the author of Understanding Anthony Powell (University of South Carolina Press, 2004), Theory After Theory (Broadview, 2010)Barbarian Memory (Palgrave, 2013), and Contemporary Australian Literature: A World Not Yet Dead (Sydney University Press, 2015), as well as many other books and journal articles. including contributions to Exemplaria, Science-Fiction Studies, Leviathan, Victorians Institute Journal, and Extrapolation. He currently is Associate Professor at the Center for Applied Liberal Arts, New York University. 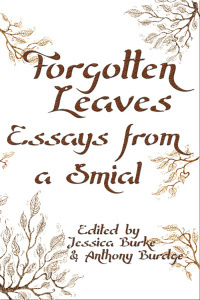 Professor Birns has presented at a previous NY Tolkien Conference, and contributed to, and compiled the index for, our book Forgotten Leaves Essays from a Smial, which will be available for purchase at this event. In addition after the presentation, and a lunch break, we welcome everyone to join us for readings from the work of J.R.R. Tolkien. If you have a favorite passage you would like to share with attendees then by all means please bring it along. We look forward to meeting with you all and celebrating J.R.R. Tolkien together again! !